the Main square of the city – Sultanahmet – the most lively area of Istanbul. It consists of two parts. The first Park between the mosque Aya-София and Blue mosque. 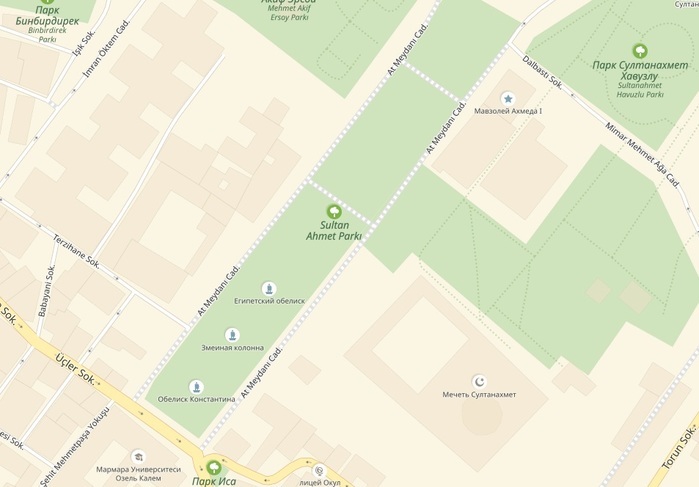 We will focus on square, which stretches along the Blue mosque and the Hippodrome. At the very beginning is the mausoleum of the Sultan of the Ottoman Empire Ahmed I (1590 @- 1617 gg). Horse racing in ancient times was very popular, so in every more or less large city Racecourse attended required. It was built in 203 ad. In 330, the Hippodrome was an increase and embellished. He was about 450 meters long and 120 meters wide. Spectator stands could accommodate 50 thousand people. the Hippodrome was the center of sports and social life. He belonged to the Palace. In the IX century Imperial residence was moved from the Grand Palace and Hippodrome gradually began to decline, and finally destroyed and looted his crusaders in 1204. They also stole the four bronze horses that originally adorned the roof of the starting room. To our time from the racetrack, there"s almost nothing left. The magnificent material from which it was built, columns, marble, stone blocks over the years have taken away for needs of urban construction. After the construction of the Blue mosque the place where the Racecourse was used as an outdoor arena for equestrian dressage. In addition, it was the arena for lavish ceremonies and other fun events. today, the Hippodrome is a large square, and its treadmills are buried under 4-5 meter cultural layer. at the entrance to the area is very beautiful monument, built in 1901, the German fountain. It is a gift of the German Kaiser Wilhelm II visited Istanbul in 1898. The fountain was made in Germany, disassembled and brought to Istanbul and assembled on the spot. the Fountain is built in neo-Byzantine style in the form of an octagon and decorated with Golden mosaics inside. Name" фонтан" – not entirely true. In fact, the fountain in our understanding we will not see. In seven sides of the marble base is mounted taps and attached bowls for water runoff. On the eighth side is the stairs leading inside the gazebo. But there are a number of" настоящий" fountain. in the heat of Summer he"s just needed. the Square is always full of people. traditionally the square was decorated with trophies from the campaigns, monuments and statues. To have survived the Egyptian obelisk, Serpent column and obelisk of Wicker (column of Constantine). 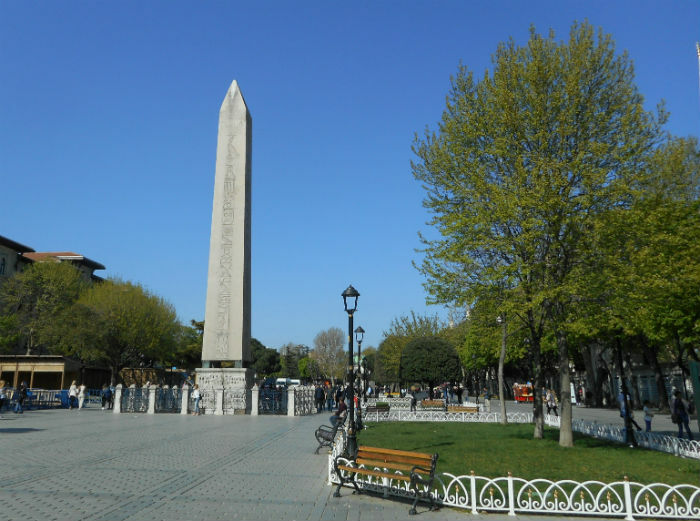 a Special attraction of Istanbul is the Egyptian obelisk, or the Obelisk of Theodosius. He was brought from Luxor in the year 390 the Emperor Theodosius I and was installed at the track on a specially made marble pedestal. On the pedestal depict different scenes involving the Emperor Theodosius and the stage of installation of the obelisk in the Hippodrome. 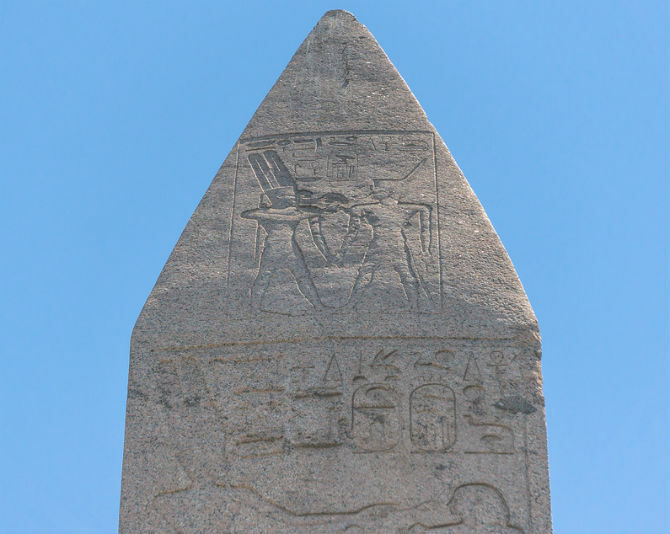 On all sides of the obelisk are Egyptian hieroglyphics depicting the heroic deeds of Pharaoh Thutmose III, in the upper part depict the Pharaoh and God Amon. When transporting the original obelisk with a length of 32.5 metres were shortened and currently, its height together with the pedestal reaches 18.80 meters. the Pedestal consists of two parts. All four of its sides are covered with reliefs and two dedicatory inscriptions. The weight of the obelisk reaches 300 tons. the Serpent column was brought from the Delphic temple of Apollo in Greece in 326 on the orders of Emperor Constantine the Great. The column symbolized the victory of 479 BC the Greek cities-государств over the Persians at Plataea. In the original this column, with a height of 6.5 meters, consisted of three intertwined snakes and was surmounted by a Golden three-legged bowl. the Cup was lost in antiquity, the snake heads were smashed in 1700. The column was used as the fountain and had 29 open-grooves on the bronze base. Currently, the column height of 5 meters. 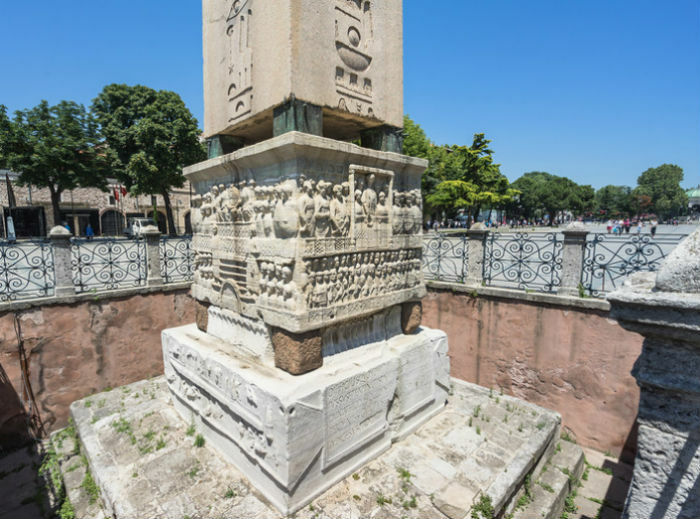 Obelisk of Constantine was built of stone blocks on the orders of Emperor Constantine VII in memory of his grandfather, Basil I.
the Initial height of the column, covered with gilded bronze sheets, was 32 meters. Leaves were stripped and melted down by the crusaders during 4-го crusade (1204). Currently, the column height is 21 meters. 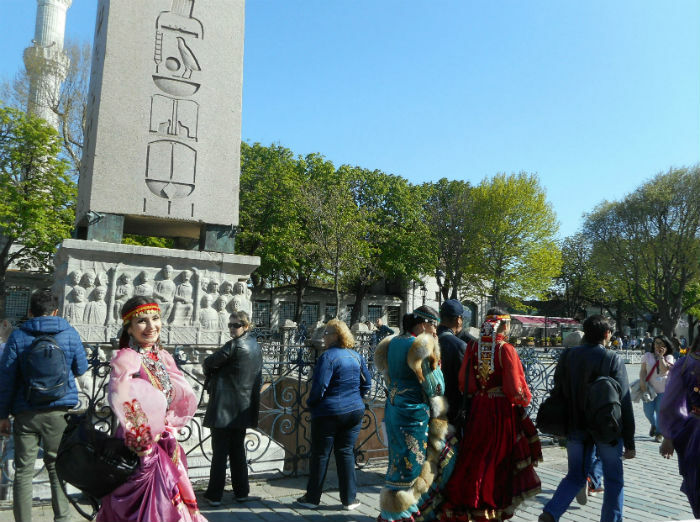 the square history is intricately put together different peoples, cultures and religions. the Unique atmosphere of its unforgettable and unique.